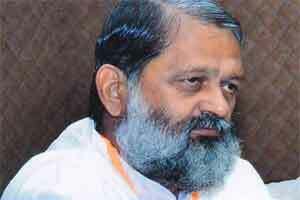 Chandigarh: Haryana Health Minister Anil Vij said that Ayurvedic Mobile Dispensaries would be started in all four divisions – Ambala, Rohtak, Gurgaon and Hisar – of the state. He said a provision has also been made to open six ayurvedic dispensaries every year which would enable patients to get treatment facilities in their nearby areas. Vij said the matter of providing salary, annual increment and Group-A status to ayurvedic doctors on the lines of allopathy physicians would also be considered sympathetically. The status of pharmacist would also be given to ayurvedic dispensers, he said, adding they would be later promoted as senior pharmacist and chief pharmacist. Vij said that outstanding employees of all categories of the Health Department would be honoured and ordered the officials to prepare norms in this regard so that there would be no discrimination with anyone. He also directed to prepare gradation list of supervisors and provide mobile SIM cards to them. Viz was presiding over separate meetings with AYUSH Medical Officers’ Association, Ayurvedic Dispensers’ Association and Health Supervisors’ Union here.